The Small Geometric Fireplace Screen with Doors by Plow & Hearth adds high style and protection to your hearth and home. 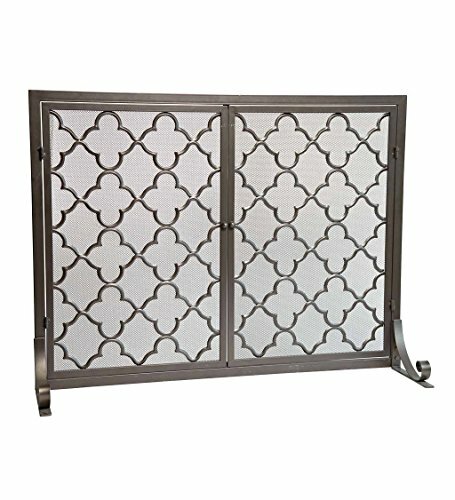 The on-trend geometric trellis design adds elegance to this highly functional firescreen. Two hinged doors make fire-tending easier and safer for peace of mind - no need to lift and move the screen back and forth from the burning fire. The straight doors have knob handles and are held closed by a magnetic latch. The square tubular steel frame is lightweight, yet rigid and strong. The front feet feature a scroll design for added sophistication; back feet bring additional stability. The rich powder-coated finish is highlighted with lightly burnished accents for beauty with or without a fire.